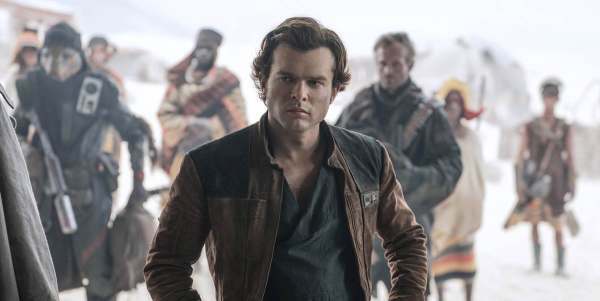 "Solo: A Star Wars Story" looks great and has some nail-biting action but has zero characterization. There's nothing in the movie that adds to our understanding of any "Star Wars" character. Alden Ehrenreich's Han Solo has no story arc whatsoever. He starts out as a good-humored maverick with a heart of gold and ends exactly the same. There's no attempt to take his upbringing on the brutal slave world of Corellia and show how he could overcome that to become a hero. That's not bad in of itself. but it creates a new problem since it directly conflicts with the portrayal of Solo in "Star Wars" (1977) as a selfish money-loving scruffy nerf herder. So we have to assume there's a story in between the movies that would turn him into the self-centered pirate we meet at Mos Eisley Cantina. While Donald Glover does an amazing job as Lando Calrissian his character is still a mystery. Lando is shown as a charming amoral hustler who plays cards and looks out for himself. The movie ends exactly the same. But he's very different from the man we meet in "Empire Strikes Back" who becomes the leader of a city and makes questionable choices. The movie introduces a few new characters like the wonderful Emilia Clark as Qi'ra who plays a woman from Solo's past with a dark secret that's never really revealed. Paul Bettany is chilling as the ruthlessly charming gangster Dryden Vos who has no motivation besides money and power. Phoebe Waller-Bridge shines as the L3-37 who's fighting against robot "slavery" but has no real arc either. The only character that has any kind of arc is Woody Harrelson who plays the thief Beckett. His character has a few surprises under his gruff, likable charm but we only get a few clues why he's the way he is. So what's the point of "Solo"? Not much. Some great action scenes and a few memorable moments. There's also a ridiculously pointless cameo that has everyone buzzing but adds nothing to the story. As a final note, the movie fails the Nichols test. Are they socially or economically superior to the highest billed white character? Yes. They're more successful economically but both poorly regarded socially. In the end, Solo fails not because it tried "too hard" but because it didn't try anything at all. Not Recommended. Wait till it hits home video. Official synopsis: "During an adventure into a dark criminal underworld, Han Solo meets his future copilot Chewbacca and encounters Lando Calrissian years before joining the Rebellion." Check back with the Geek Twins for more Solo: A Star Wars Story movie news and hype! What did you think of "Solo"? 8 Movies to Watch Before "Ant-Man and the Wasp"
Contest: Win an "Incredibles 2" T-Shirt! Wonder Woman 2: How Could Steve Trevor Be Alive? What is "Star Wars" Fatigue?